Online image and graphic editors, like Canva, are becoming the go-to choice of small businesses. Canva offers millions of stock photos and thousands of free templates, so you can create stunning logos, business cards, social posts, and more. However, you may want a less expensive or easier solution, and if so, consider these Canva alternatives. Lucidpress (Best overall) Small businesses that need unlimited design access at an affordable price. It’s undeniable how popular Canva is, and it’s with good reason. Canva is an affordable and easy way to create almost any kind of visual you need, whether it’s a stock photo, an image of your own you want to edit, or graphics for marketing materials. Plus, it’s all hosted online, so you don’t have to install anything. We kept all those features in mind when we chose alternatives to Canva because while Canva is great, it still has some pain points that some people want to get away from, such as occasional lag, a subpar search function, and a la carte ordering of assets, which can bump up the cost. Free Version: We tested the free version of each software or service, if applicable. If a free version does not exist, we tested the free trial to compare what’s available. Pricing: We compared the pricing for individual and team plans to ensure each Canva alternative would be suitable and affordable for a small business or a solopreneur. Photo Editing: The editing tools should be intuitive, or at least include explanations of what each tool does. We looked for the basic tools, such as cropping, flipping, and adjustment of brightness, contrast, etc. Stock Photos: We considered the quality and quantity of stock photos made available to you at each plan. 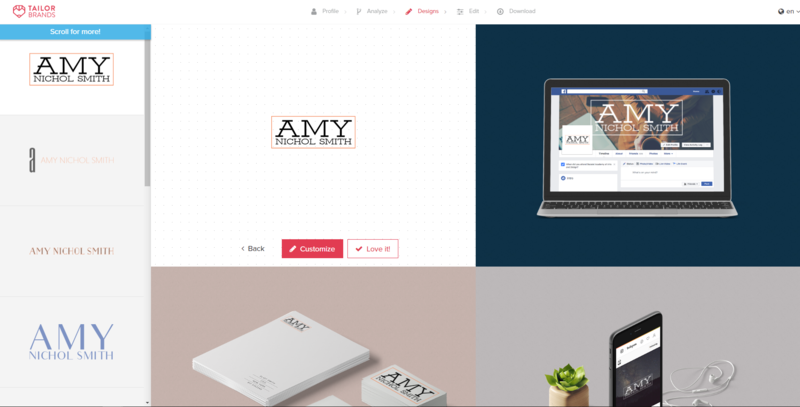 Templates: From business cards and logos to social media posts and infographics, we looked at what each Canva alternative offered in the form of templates, including the variety, amount, and design quality. Graphics: We considered the types of graphic elements offered by each software or service, including icons, illustrations, shapes, frames, and more. Fonts: We looked at the included fonts for each alternative to Canva. You should have plenty of options, or at least the option to upload your own font if you don’t see what you need. Print Options: Canva offers printing services for any of your designs, so we looked for this in the alternatives and compared the pricing options. As an all-in-one photo editor and graphic design solution, Canva almost hits all the marks. If you can imagine it, you can probably design it in Canva. The free option might be good enough for a freelancer, but you’re limited in photo selection unless you want to pay per asset. If you want fewer limitations, more access, easier to use tools, and unlimited options at a better price, there could be a better alternative to Canva. 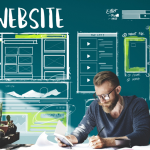 For those moving from traditional design software to the online world, Lucidpress makes it easy to transition. The tools for layout are simple to understand and they’re labeled, just in case it isn’t obvious to you. The automatic save feature is similar to Canva’s, so you can start on a project and come back to it later, if needed. The templates Lucidpress offer are simple designs, so you can adjust as you’d like. 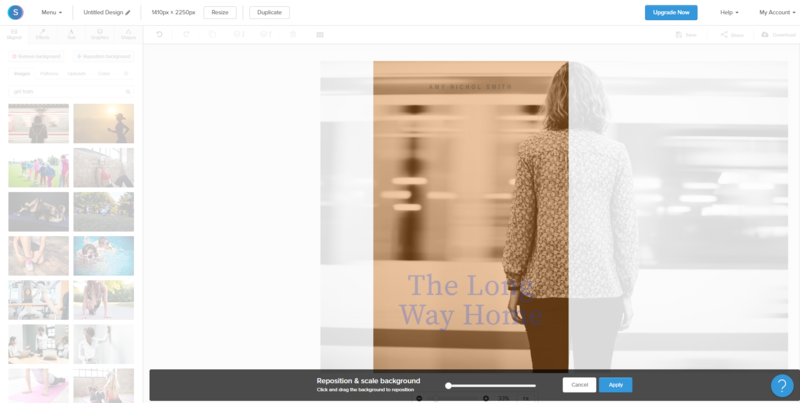 Perhaps because of the simple interface, Lucidpress loads much faster than Canva, and rarely hangs. Plus, Lucidpress is more affordable than Canva overall, including printing. Unlike Canva though, Lucidpress doesn’t offer free (or even paid) stock photos, so you’ll have to upload your own. 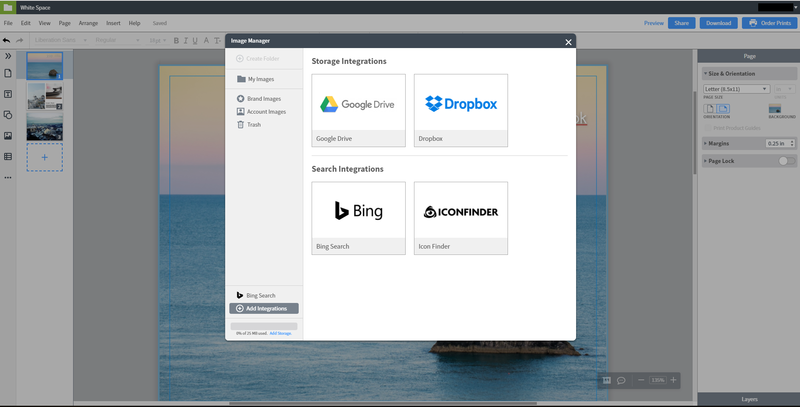 Lucidpress limits your local storage, but you can integrate with file storage apps to store images and finished graphics. Lucidpress gives you plenty of plan options, starting with its free plan. As long as you don’t go over the 25 MB you’re allowed, you should be good with the free option. However, that’s severely limiting. The low-priced Lucidpress Basic plan gives you unlimited pages and documents for only $5.95 per month. In fact, Lucidpress is more affordable than Canva in almost all areas, but it doesn’t offer stock photos, and it has fewer template options. If you stick with the free plan from Lucidpress, you’ll get access to the basic templates, editing features, and a tiny bit of free storage. In fact, 25 MB of free storage isn’t much at all. And there’s a trick to emptying your storage space. You’ll have to unpublish documents before deleting them to clear your trash—and it takes up to seven days for it to be removed and your storage recovered. Lucidpress’ free plan is more limiting than Canva’s. For just $5.95 per month, you’ll get bumped up to 1 GB of storage, and you’re allowed unlimited pages for your documents. You’ll have much more freedom to create at this account level. Plus, your designs will now be print-ready at 300 dpi, so your documents will look clean and sharp. It’s also at this level that you’ll have access to the premium templates, but you’re still going to have more available to you from Canva, even on its free plan. The Lucidpress Pro plan will cost you $12.95 per month, but it ramps up the free storage to 2 GB, allowing you to upload even more images to your account for use in your designs. Just like Canva at this price point, you’ll be able to upload your own custom fonts to use on your documents. If you need design software for a whole team, then Lucidpress Team is the option you’ll want to choose. It starts at $30 per month for a three-person team, and goes up from there in $10 increments ($100 for a 10-person team, for example). All limitations are removed at this level (except storage, which stays at 5 GB), and you’ll get access to team management tools, so you can choose who does what on the Lucidpress account. Canva’s paid plans, depending on which you pick, give you priority support or a dedicated account manager, which Lucidpress doesn’t offer. Although Lucidpress offers fast-loading design software at reasonable prices, it’s woefully lacking a couple features that could make it better. No stock photos at your fingertips means you’ll have to take or find your own. When it comes to support, Lucidpress gives you a searchable knowledge base, forums, and you can email for help. However, there’s no phone, live chat support, nor dedicated account manager. When you read through user reviews, it’s clear that those who have used the Lucidpress platform love it for its simplicity and stability. Lucidpress makes it possible for anyone with any design skill level to make professional-looking materials for marketing, whether for digital or print publication. Also noted were the integrations to file sharing services. The glaring omission users mentioned is free stock photos. Whether you need business cards, a sharp-looking newsletter, a resume, invitations, or digital ads, Lucidpress gives you templates for a good starting point. You’ll have to provide the photos, but layouts are ready-made, which means you need little to no design experience to be successful. 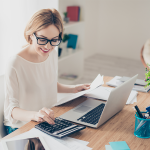 The free version might be enough for an individual, but a small business might want to upgrade to the Pro or Team plan to get more storage and unlimited documents and pages. Where Snappa really shines is in its easy-to-use interface and its shortcuts to getting your graphics done and uploaded as quickly as possible. Compare Snappa and Canva, and you might wonder where it really differs (even the names are similar), but the differences come to light when you look at the images, templates, and tools Snappa offers that go beyond Canva’s offerings. All images available through Snappa are free, regardless of the plan you choose, and you get access to all the templates, too. You can change the color, contrast, brightness, position, and more of an image in Snappa’s editor. One of the best freemium plans for design software belongs to Snappa. The Snappa Starter plan gives you access to all the same photos, graphics, and templates that the paid plans have. Upgrade to the $10 Pro plan to get unlimited downloads and social accounts. The Snappa Team plan gives you all the features of Pro along with team collaboration, so you can have up to five colleagues work on the same account for only $20 per month, which is nearly $45 per month cheaper than Canva for a similar setup. The free version of Snappa gives you instant access to all the elements the design software offers, including templates, images, graphics, and shapes. You can get started right away with your ads, social media posts, or almost any other type of visual you can think of. You get five free downloads per month, which is limiting, especially when you consider Snappa Starter doesn’t let you save anything. On the other hand, the free version of Canva auto-saves as you work, but limits your storage. For $10 per month, you can subscribe to Snappa Pro, which unlocks many of the free plan’s limits. You’ll get folders where you can save your designs, unlimited downloads, the ability to connect however many social accounts you have, and integration with Buffer, so you can schedule social media posts. This plan is less expensive than Canva, and you’ll never have to pay for images. When you have a team of people working on graphics for a small business, you need a plan that can accommodate all of you, like the Snappa Team plan. For $20 per month (if paid annually), five colleagues can work on the same account. It’s far more affordable than Canva for Work for five users, as long as you don’t mind committing to a year-long subscription. One of the biggest conveniences that’s noticeably absent from Snappa is auto-save. You have to manually press the “save” button to keep a design, and it’s only available to paid plans. It’s one of those features you expect as standard, and it’s available with Canva. Also, after scrolling through hundreds of templates, it’s hard to distinguish between them all at times—many of the designs seem tired, generic, or duplicated. It isn’t surprising to see user reviews that tout the ease of use as being the greatest attribute of Snappa. It also gets big props from users for allowing all photos and templates for all plan levels with no restrictions or added fees. The biggest problem users have with Snappa seems to be the lack of a save option for the free plan. You could know exactly what you want to create graphically, but you aren’t quite sure how to get there, and that’s who Snappa is made for: the non-designer. With Snappa, you can create beautiful graphics for social media posts, promotional materials, and your website without having to hire a graphics designer. Plus, it won’t nickel and dime you for images the way Canva does. As a relative newcomer to the online design platform arena, Stencil is already making waves, or at least making it easier for people to create social media imagery for personal and business use. The design software takes the basics of design software you might know by name—but seems intimidating (Adobe Photoshop CC might come to mind)—and makes it far simpler to use with automated features, like resizing and pre-made filters. It offers a few different plans, including a free version. It’s a more intuitive interface than Canva, but it still suffers from a few pitfalls that are familiar to Canva users. 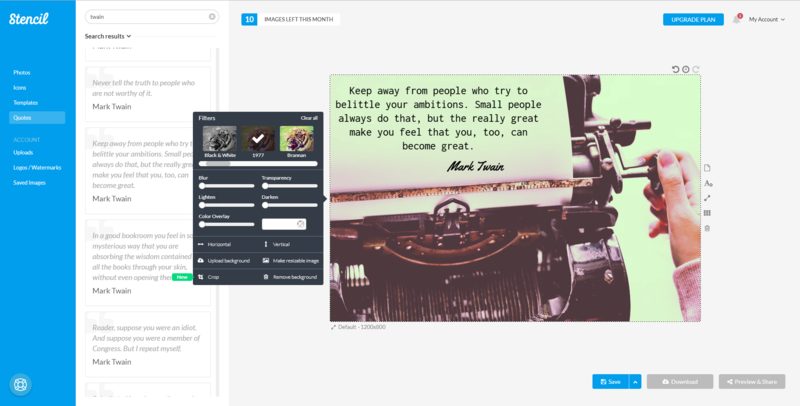 Stencil offers one of the most intuitive interfaces for editing images and graphics. The free version from Stencil limits you in a few ways. You can only create up to 10 complete images per month, and the photos and icons you have access to are also limited. At the Pro and Unlimited levels ($9 to $12 per month), you can unlock unlimited access to more than 2 million photos and 1 million icons that are all royalty free, unlike Canva, where you’re still charged for some photos. Plus, Stencil is more affordable at all levels than Canva. As stated earlier, the free version of Stencil is limiting in many ways, but it includes some features that Canva limits, like automatic “magical” resizing (images auto-fit your canvas). The result is faster image creation. You won’t be able to use any of the templates, though, while Canva gives you templates for the free version. However, if you have a little design experience, that shouldn’t be too much of a roadblock for you. At the Pro level, Stencil unlocks access to the more than 2 million photos and more than 1 million icons it offers members—with zero royalties to pay—for $9 per month. Additionally, you get access to more than 2,450 Google fonts, and you finally get to use templates. Stencil offers fewer templates than Canva, so it’s lacking in that area. Plus, at this level, you only get to save 100 assets to a favorites folder. Upgrade to the Stencil Unlimited plan for $12 and you’ll get to create as many images as you’d like and save as many favorite assets as you want. Plus, you’ll be able to send up to 100 images to your mobile device per month, which makes it easy for you to upload to your Instagram account. Stencil suffers slightly from the same issue Canva has: slow loading. Occasionally, when you make changes to something, it takes a while to show the change, whether it’s making an image more transparent or applying a filter. Although you can create images at 300 dpi (for printing), it isn’t a main feature of Stencil. Plus, it doesn’t offer printing and shipping options, like Canva. Look around online for user reviews and you’ll see Stencil is well loved. It gets a big thumbs-up from most users, who adore the easy-to-use interface and automated features and which help speed up the process of image creation. Although many users noted the helpful integration with Buffer for scheduling social media posts, it would’ve been easier if Stencil included its own scheduling feature. Whether you’re an author, small business owner, blogger, or anything in between, Stencil is an excellent tool for quick and easy image creation for social media posts. Sure, you could use it to create e-book covers or logos, but it’s mostly made for attention-getting social media posts, regardless of which platform you use to connect with your customers or fans. Like Canva, Stencil is affordable, but even more so by a few dollars, and if you’re on a paid plan, you’ll never have to pay extra for the images or icons you want to use. Design work isn’t for everyone, and that’s where Tailor Brands comes in to save the day. Every business needs a logo, at the very least, but not every small business owner wants to try to learn how to design one to get the logo they want. Maybe you don’t have the money to hire someone to do it either. Tailor Brands simplifies the process by asking you questions to get an idea of your style and then automatically creates a logo for you using algorithms. Canva may give you templates as a springboard, but it won’t do all the design for you. Scroll through the various logos created for you based on your answers to “this or that” questions to find your perfect design from Tailor Brands. There is no free option from Tailor Brands, unless you count the ability to test out the service. You can go through the process for free, but you won’t be able to use the logo without subscribing to one of two monthly plans. The Dynamic Logo plan gives you everything you need to be able to use your logo for your business for $2.99 per month, if you choose the annual billing cycle. The Premium plan offers you a lot more for $10.99 per month (annual cycle), including extra design tools. Canva gives you more bang for your buck, but Tailor Brands is affordable design where you hardly have to do anything other than give your input. Technically, you can subscribe to the Tailor Brands Dynamic Logo plan and get a logo for $9.99. Once you cancel, you’ll still have your logo and the rights to it, but you will lose access to edit tools and storage for your logo in the Tailor Brands platform. Keep your subscription and you’ll get seasonal logos and social analytics, so you can see how your logo is performing with your customer base. Compared to Canva, Tailor Brands is more affordable when you choose the paid plan, but you’re limited to what you can do on Tailor Brands. Choose the Premium plan from Tailor Brands for $49.99 per month (or $10.99 per month, if you choose to pay annually) and you’ll unlock a lot more options to help you build your brand. You’ll get the EPS version of your logo, which means it’s much higher resolution and you can get printed materials with your logo. The month-to-month subscription is much higher than Canva, but you’re getting designs made specifically for you—all you have to do is point and click to choose the design you like best for your business deck, business cards, social media covers, and more. You aren’t going to get much flexibility with Tailor Brands, but that isn’t what this online design service is about. The tools you can use to edit your logo design are limiting, but if you’re choosing Tailor Brands, it’s because you don’t want to do the designing yourself. Truth be told, you’re limited in the actual designs, as well (this is logo design software). Although Tailor Brands offers lots of products that require printing, the company doesn’t do it for you. Many of the users who reviewed Tailor Brands liked the ease of use the platform provides. If you know a little about design, you can adjust bits and pieces until you get your logo just right. Otherwise, users who weren’t crazy about Tailor Brands mostly complained that the designed logos were generic and not memorable. It isn’t exactly an apples-to-apples comparison when Tailor Brands faces off against Canva. However, Tailor Brands is a match for you if you want little to do with the design process. It’s overall much more affordable than hiring a professional graphic designer to create your logo, and you still get to tweak a few things here and there to customize it. Tailor Brands is the design service for you if you want to be almost 100% hands-off in the design process. As the granddaddy of online design software, Canva is arguably the best in many aspects. However, its shortcomings have been solved by some of its competitors. The best Canva alternatives are represented above. You can take all the guesswork out of designing by leaving it up to artificial intelligence-powered algorithms, and not touch a design tool at all. Otherwise, you can choose an easier-to-use platform, or pick online design software that doesn’t charge you per premium photo.